Retro Friday is a weekly meme hosted here at Angieville and focuses on reviewing books from the past. This can be an old favorite, an under-the-radar book you think deserves more attention, something woefully out-of-print, etc. Everyone is welcome to join in at any time! So this is a book I've spent a lot of time talking about. Chances are, if you've hung around these parts, you've heard me push it. But I actually read it for the first time way back in the olden days before the blog was, well, what it is now. I read it shortly after it was first published, back in 2007, when I was writing monthly posts, mere collections of mini-reviews. So Song of the Sparrow got shortchanged. I decided to address that situation today. The fun thing is lots of friends have read (and reviewed) it since, and so I was able to trip through their lovely thoughts and remember my own. When I heard about a retelling of Tennyson's "Lady of Shalott," I was so in. I mean, I'm nothing if not up for a good Camelot tale. I could bore you to tears with my obsession with the entire Arthurian legend, but who needs that on a Friday afternoon? The thing is, when I heard this retelling was, like Tennyson's version, told entirely in verse, I was no longer so sure. Truthfully, I tend to like my modern poetry short and to the point. So I did what I often do. I went to the bookstore and read the first page. Then I read the second page. And on through the tenth, at which point I accepted the delicious inevitable and bought the book. Elaine of Ascolat is sixteen years old and alone. The lone woman among an endless encampment of men, she has grown up wild and independent and determined to keep her father and brothers and friends alive. Though she is not allowed to fight alongside them, she works tirelessly in any way she can to keep their spirits alive, to mend both their limbs and their souls between battle forays against the ever-encroaching Saxons. After her mother died, her father brought his two sons and one small daughter to live with the soldiers. And so Elaine's oldest friends are Arthur, Lancelot, Gawain, Tristan. But when Ambrosius Aurelius, dux bellorum, is killed, Elaine must watch the laughing eyes of her friends turn grim with strain and responsibility. She must watch as they rally around Arthur--their new leader. As they reform in their new roles and battle leaders and men. And she must watch as a someone new enters their lives and disrupts their old balance perhaps forever. Gwynivere. Haughty and proud, she ensnares Elaine's friends with seemingly no effort at all. But, though her boys seem entranced, Elaine can see clearly just how much craft Gwynivere puts into the web she casts. And when that web extends to Lancelot, the one she loves most, wild, independent, determined Elaine decides it is time to fight at last. This book. This book set a flock of butterflies free in my stomach on the first page. The writing is that heady blend of urgency, vision, and nostalgia. I loved Sandell's revisionist version of Elaine of Ascolat. I knew there was more to her than her magic web and her love for Lancelot. I just knew there was. Sometimes you meet a character, sometimes over and over through the years, and you know her. In bits and pieces, through various art forms and articulations, I have always felt a kinship with the lily maid. But it took until Lisa Ann Sandell decided to paint her version of her, for me to realize why. 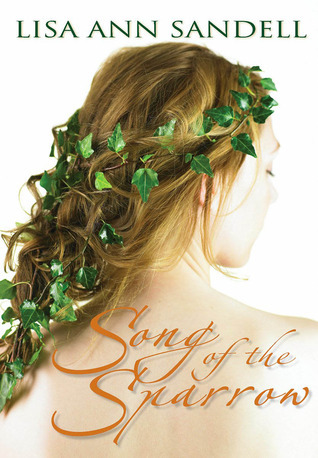 All that history you just know is there, the spell, the mirror, knotted web of threads, the loyalty to Lancelot, it all comes together in Song of the Sparrow. Any lover of all things Arthurian will tell you, it can be a life of suffering. A rich life, but a rocky one. This retelling soothes the soul. And the beautiful thing is that, by all accounts, it seems to work for newbies (even those utterly uninterested in the myth) as well as us dedicated fans. And it's because the writing and characterization are strong and sure. I'm so glad this Elaine chose to fight instead of die. I loved beautiful Gwynivere, and the choice she makes. The women in this novel are ace. They inhabit the tale, fleshing it out with life and pain and wanting, and together they are my favorite part about this version. But right up there with the ladies is the way Sandell wove in Tristan and his horrible past. In a genius move, we get a glimpse of Tristan (of Tristan and Isolde fame), and I kind of am of the opinion it should always be this way. Forgive the long passage, but it is the moment Elaine first comes to the camp, and it is a favorite. It was nighttime when we reached the camp. of what it saw and heard again. against his dirty ash face. He looked like a scared, wild animal. I must have looked the same. you will be a fierce fighter. Aye, I can see it in your eyes. kneeling to look in my eyes. He had blankets for Lavain and me. And once more I felt protected. unevenly sewn of corn husks and rags. a wooden sword in his hand. He said his name was Tristan. He said his name was Tristan . . . This one joins Beauty, Daughter of the Forest, The Outlaws of Sherwood, and Valiant on my most beloved retellings shelf. I love gifting it. I love re-reading it. And I will be doing both for the foreseeable future. Every time I see this book, or hear about it I think of you, Angie. I don't know why I haven't actually read it yet, but one of these days I will! Laura, lol. That makes me smile. One of these days I hope you enjoy it. I've never been an Arthurian fan (the adultery has always been a deal breaker), but this made me change my mind. I don't know how anyone wouldn't think it was lovely too. I really understand that. It's heartbreaking and hard to get past. I am so thrilled to hear this one worked for you. Lovely is the only word, isn't it? I love how she played around with the original tales! I'm not going to lie, I had written this one off as soon as I learned it was in verse. That is SO not my thing. So I'm thrilled that you included such a long passage because it kind of helped to assuage my fears and get me to think about trying something I otherwise wouldn't have. I LOVE retellings though, and Arthurian legend (which I really haven't read enough of since I was younger and devoured everything I could get my hands on). I'm sold, thanks! Heidi, I completely understand. I'm always a bit wary approaching a novel in verse. But it really is clear from the start with this one that it's one of the good ones. Let me know when you do get around to it. I'd love to hear your thoughts! Oh, Angie. I hate/love you. Because I have this legit huge TBR right. With looming deadlines. And I legit don't want to read those books. I want to read Song Of The Sparrow and Magic Bites, because you weave this big magical web on your blog of great sounding books and ALWAYS make them sound more appealing than whatever I have to weave. Also I can see my unread copy of Song of the Sparrow peaking out at me. Come on, they're both on your shelf. You know you wannna . . .
Why, thank you. :) I remember you reading this one. So glad it worked out well for you. Tristan is so lovely. I am forever delighted by how she rendered him. I hate that I didn't like this one! There are so many folks whose opinions I love and respect who loved it, but it didn't work for me. I may need to reread in the future, because my Lady of Shallot adoration should have no bounds. Aw. I'm sorry. I know the feeling well. No worries. If it doesn't work, it just doesn't work. If you do revisit it, however, let me know. It's held up for me on rereading, but I'd be interested to see how if it fared better after a less than stellar first go. I'm so glad you think so. Thanks so much for participating. I've fallen off a bit, and really need to kick it back in gear. I wish I had known more about the Lady of Shallot story before I picked this up as I imagine that would have greatly enhanced my enjoyment. As it was, I admired the writing but I didn't fall in love with it. Hm, it might have. I do love the tale and all of the beautiful paintings that have been created in her name. I'm an unabashed Arthurian fan and I realize this influences my reaction . . .